Piedmont Environmental Center (PEC) provides programs and a place to learn, conserve and enjoy the natural world through hands on experiences emphasizing the interrelated and fragile nature of life. Eleven miles of foot trails and the Bicentennial Greenway pass through 376 acres of beautiful hardwood and pine forests and lakeside habitats. Trail Hours - sunrise to sunset. For a list of our programs click here, or view the calendar below. 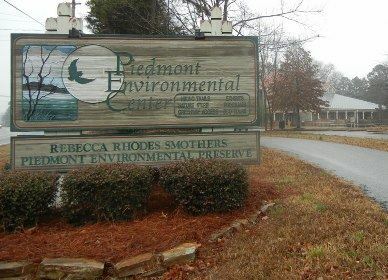 Please call the Piedmont Environmental Center for more information. We offer special field experiences and classes for students from Kindergarten through High School. Teachers can contact the PEC for class details to reserve a date for their students. Maximum number of students at PEC is 75. For groups larger than 75, please look to arrange two days. PEC presents classes rain or shine. In the event of inclement weather, staff Naturalists are prepared with alternative class experiences within the curriculum framework and appropriate to the attending grade level. Support Environmental Education Programs by becoming a member of "Friends of PEC." As a member you will receive special discount rates on trips, activities and special events. Program calendars and brochures are mailed to you giving you advanced notice of upcoming programs and activities. Memberships are on a yearly basis. Apply today (PDF).